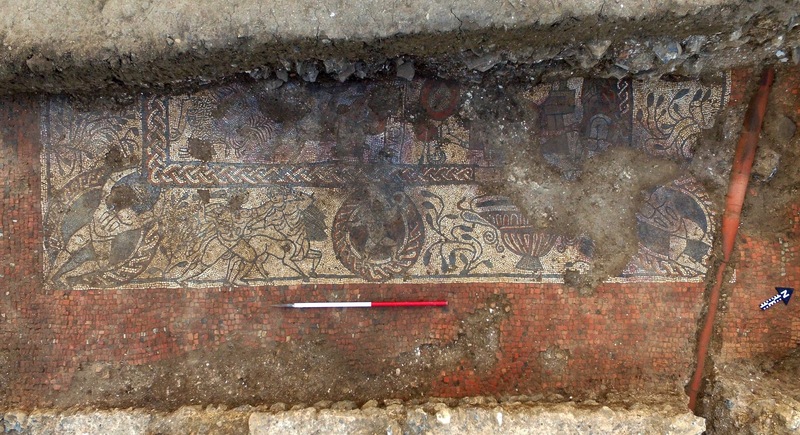 This remarkable image is part of the amazing Roman mosaic found last summer in the parish of Boxford, West Berkshire. The mosaic has been examined by experts and described as the most important Roman mosaic find in Great Britain for the last 50 years. It received widespread national and international coverage when it was discovered in 2017. The project to fully uncover the mosaic will be led by the Boxford History Project (BHP) using a volunteer workforce from the local community, with valiant assistance from archaeology groups most notably from the Berkshire Archaeology Research Group (BARG) and all overseen by professionals from Cotswold Archaeology. As usual on an agricultural site, we have to wait until harvest is finished and we have been informed that we may be able to start the 3rd week of August depending on the weather. Over £38,000.00 of the £60,000 needed has been raised so far! Greenham Common Trust has offered to match fund pound for pound, donations up to £5000 through The Good Exchange funding platform . More detailed information about the project and fundraising can be found on the Good Exchange website https://app.thegoodexchange.com/project/12262/boxford-history-project/the-wondrous-boxford-mosaic……………………and you can also make a donation if you wish – it’s really easy………….and don’t forget Greenham Common Trust will double it! Grateful thanks to those who have already made a donation.